Jan. 24, 2012–The state unemployment numbers for December, released today, show some numbers significantly lower than one year ago. Six states that have unemployment rates above the national average showed changes in their unemployment rates of 1.2 percentage points or higher. See Table C at www.bls.gov, today's press release. States with above-average unemployment and statistically significant unemployment-rate changes, Dec. 2011 vs. Dec. 2010. Ranked by change in unemployment. p = preliminary. Data are seasonally adjusted. If one were bottom-fishing for real estate bargains based on state averages, these states would be worth investigating because a substantial drop in unemployment is by itself a highly favorable economic indicator. However, where unemployment rates are still in double digits, as in Nevada and California, recovery is further away. California, Florida and Nevada were (along with Arizona) hit especially hard by a decline is housing prices. Michigan was affected more by the downturn in the auto industry. Naturally, state averages are just a first step in an analysis. Within a large state, indicators can vary widely. County data, for example, show that California's Silicon Valley (Santa Clara County) is recovering faster than the state as a whole. Putting up the divisional bulletin boards. 2012 actual number of boats - 112. I took some photos of the Key West headquarters, where the three divisional bulletin boards were being nailed up (see photo). They close off an entire street during Race Week. Interviews with Premiere Racing, the Key West race manager, explicitly mention the poor economy as the reason for the decline in boat entrants. For example, last May there was a question to the organizer, Peter Craig, about Race Week cutting back from five to four days after the 2011 dropoff, or even continuing at all. The question continues to be asked and a four-day race may emerge for some boats. The key to the event is in the sponsorships and Craig was confident in mid-2011 that he would assemble a good sponsor list for the 25th annual Race Week, his 19th. He has done this! Nautica was the title sponsor in 2010. Quantum Sail Design Group is in 2012. Kelly's Bar and Brewery (the "southernmost" brewery not counting Hawaii) is the headquarters venue. An event organizer can go broke while the One Percent are postponing a traditional activity for just a few years. If you want to follow this colorful event, go to Quantum's blogspot page and sign on for one of the various real time reports of the race. 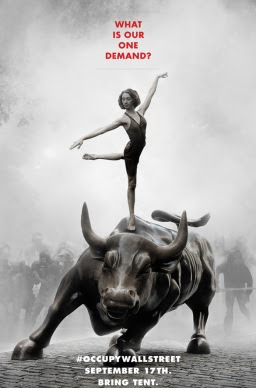 Occupy Wall Street from the start showed a genius for branding worthy of the best of Madison Avenue. The original call by Adbusters to bring people to Wall Street on September 17, 2011 combined the language of collective decision-making with a forceful image of an assembly target. The photo collage of a "Ballerina on a Bull" (at left; my title) echoes Pablo Picasso's 1905 "Acrobat on a Ball" (at right), with its juxtaposition of slender flexibility and awesome strength.The Picasso painting has been on display at the Prado in Madrid all of 2011, on loan from the Moscow State Pushkin Museum of Fine Arts. My wife Alice and I were in Spain, celebrating our 40th wedding anniversary, on the day OWS came to NYC. The Picasso was heavily advertised and it was a magnet that attracted us to the Prado. In early October I posted a comment on the painting's power. As we left the Prado we were engulfed in a crowd of protesting teachers, angry about the layoffs imposed on Spain by EU deficit-cutting strictures. One banner said (in English): “If you don’t like the cost of education, wait till you discover the cost of ignorance." When we returned to NYC, we found Mayor Bloomberg expressing concern that the OWS encampment would cost the City economic growth because tourists would stop coming to New York. This would indeed be a valid fear if the OWS protest was violent or out of control, as in London. But the OWS occupation has been a peaceful protest in the spirit of Martin Luther King. I wondered whether the OWS presence might actually be a little gift, a magnet, attracting tourists to visit rather than repelling them. In fact, tourists have been asking NYC tour buses to be sure to go by the location of the OWS camp. When the camp was there, tourists were getting out of the buses to walk around and take pictures. They often outnumbered visible protesters. Columbia Journalism student Judy Le's short documentary shows this, and includes the Mayor's statement of concern about the impact of OWS on tourism. Take three minutes to watch this well-constructed and engaging "Occupy Tourism" video. The photo below shows the OWS kitchen plan for three meals a day through November 13. Two days later, the NYPD cleared the area and the NY State judiciary ruled OWS was not to be allowed back. At midnight on December 31, about 500 protesters tried to re-occupy the park, and failed. The OWS story is not over. It continues to annoy the Mayor and NYPD Commissioner Kelly. Keeping track of protesters in the cell-phone and Twitter era must be a challenge. But the NYPD's capabilities in this area are second to none. So far, I argue that OWS has had some value for NYC. The fact that an anti-Wall Street group was allowed to protest peacefully for many weeks is evidence that Wall Street coexists here with people of conscience. The OWS has benefited as well. It was given a few weeks to remind people of the systemic risk-taking that brought down the world financial system. They came here because many of the riskiest (reckless) bets were placed downtown. AIG has since sold its biggest buildings at 70 Pine and 72 Wall, but the credit default swaps were engineered in lower Manhattan. The nation has benefited as the OWS impact has rippled outward, and its message echoed. It has helped turn around the public debate. The full-throated call for immediate deficit-cutting has abated, as it should, since it is counterproductive in the context of continuing high unemployment rates. Issues about American inequality of opportunity and lack of mobility for the "99%" (another brilliant bit of branding) are being brought before the public more widely and aggressively than I can remember in my lifetime. President Obama has been emboldened to make an overdue recess appointment of Richard Cordray to head the Consumer Financial Protection Bureau. Meanwhile, on the specific concern about about the impact of OWS on tourism, the numbers coming in indicate that fear of tourist cancellations is unfounded. The Mayor has announced that his goal of exceeding 50 million tourists for the first time in 2011 will be easily surpassed and New York City for the third successive year is the Number 1 tourism destination in the United States. Jobs associated with tourism - the "leisure and hospitality" industry - have continued to rise rapidly in NYC through the final month of the OWS camp. In the table below, note how much faster these jobs have grown in NYC compared with the nation, the state, and other parts of the NYC metro area. Sources: BLS, Press Release, Dec. 15, 2011. NY Area Employment, Nov. 2011, Jan. 4, 2012. These numbers (and many others) are not consistent with a narrative of widespread cancellation of conventions or trips. Tourists do not seem to have been scared away by the OWS presence in September-November 2011. Rather, they have asked the tour operators to please bring them by so they can see for themselves and (in the words of a tourist in the Judy Le video) "be part of history in the making". In November the number of new tourism-related jobs in NYC compared with the same month a year earlier was close to 13,000, nearly twice as many as the equivalent increase one year ago. So thank you, OWS and Mayor Bloomberg and Commissioner Kelly, for keeping the protest basically within nonviolent boundaries. The British (and Canadians and Australians) are still coming! To broaden the base of foreign tourists coming here - they are the biggest spenders and many are facing economic issues back home - we must focus on making it easier for more of them to get visas to make the trip. Gawker in 2010 said farewell to candy cigarettes. But the death of these products was exaggerated—they are still for sale. I argue they have a high social cost and contribute to the U.S. budget deficit. Bear with me. Follow the dots, 1... 2... 3... 4. Candy cigs are wrapped in packs that look just like packs of cigarettes, with external markings that imitate those of regular cigarettes. The product is a box of 24 packs of candy cigs in three layers of eight. It weighs two pounds and costs about $5, sometimes more.The candy is not allowed to have the red tip that you may remember from your childhood, according to a "Government ruling". Now let's look at the U.S. budget. Dr. Peter R. Orszag headed the Congressional Budget Office (CBO) in 2007-2009. Then he headed the Office of Management and Budget (OMB) in Washington. He presented his views on the cost of medical care in a speech in New York City on November 15, 2011 to the New York Association for Business Economics (after leaving OMB he became Vice Chairman of Global Banking for Citigroup in New York City). Orszag shows that medical care costs are almost entirely responsible for worrisome long-term federal budget projections. 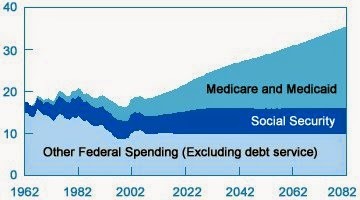 Projected higher federal spending comes almost entirely from one spending sector, health care. Health care took 20 percent of GDP in 2007 but is projected to rise to one-third of GDP in 2082. The growth is all in the top layer of spending, i.e., Medicare and Medicaid. Limit demand for health-care services by providing more education to the public and doctors about the potential for making healthy life-style choices. Develop incentives for the public (consumers of health care services) to make better lifestyle or health-care choices. These last two options lead to the relevance of candy cigarettes to health-care costs. Private health and life insurers recognize the need to rein in these costs, and many give discounts to nonsmokers. The State of Arizona is probably the first state government to propose charging childless adults on Medicaid who smoke a $50 fee as partial compensation for the extra burden they impose on the state's health system. Here is Arizona's rationale, which includes a reference to medical problems caused by obesity. Since the beginning of the recession, unemployment increased, State revenues decreased and enrollment in Arizona’s Medicaid program increased by more than 30%. The Medicaid program now makes up nearly a third of the State’s budget – second only to K-12 education. According to the Centers for Disease Control (CDC), 49% of Medicaid recipients smoke, in sharp contrast to the approximately 16% of Arizonans overall who are smokers; 25% of all Arizonans are obese. But what do those figures mean in terms of the cost of our health care? In 2004, taxpayers spent $377 million on smoking-attributable expenditures for the Medicaid population. Meanwhile, annual per capita medical spending for an individual who is considered obese is 42% higher than for someone who is of normal weight. That percentage translated to roughly $148 billion nationally in obesity-attributable medical spending in 2008. Obesity, it turns out, is hard to reverse. A child that is obese is almost certainly going to be an adult that is obese. Pounds are easy to add and hard to shed. A child that is eats poorly and does not exercise and becomes obese may as a teenager take to cigarettes in the misguided belief that this is a good way to lose weight, because smoking doesn't add calories. Not a good tradeoff. The United States needs to tackle both teenage obesity and teenage smoking. Given the role of health care costs in the economy, and the role of smoking and obesity in Federal, state and local government health care budgets, the true cost of candy cigs exceeds the price that consumers pay of $5 per carton or 20 cents per pack. The additional social cost is called a "detrimental externality" or a "negative externality" to the product. It is the cost of attaching glamor to cigarettes, of getting children used to something pleasurable continually in the mouth. It gets children used to taking long thin sticks out of convenient branded packs and putting them in their mouth for pleasure. This creates a predisposition for cigarette smoking among teenagers. It lends the stimulus of widespread advertising of cigarettes to candy. This encourages consumption of candy. If you are with me so far, the three approaches to changing public behavior are (1) a ban on candy cigarettes, (2) a Pigou-type tax, (3) an exhortation to parents not to buy this product. Of the 56 people who had commented on my review when I last looked, all of whom were presumably looking to buy candy cigarettes, none of them found my review helpful. That should not be a surprise, since some of the commenters may have an interest in sales of the candy cigarettes and the rest are at the site because they want to buy the product and are looking for information on choices among the available options. Some of the commentators took the trouble to think up names to call me, such as "candy cig police", someone "looking for something to blame". Most broadly I was tarred and feathered for hijacking a quality-assessment site to question the social responsibility of the product itself. But one person went beyond that and said that candy cigarettes are good for people who are trying to stop smoking because they need something to put in their hands while they go through nicotine-withdrawal symptoms. This user can't be the target market, given that packaging is designed as a counter-top appeal to children, but no reason why an adult can't find a product designed for a child to be useful or fun. A person who identifies herself as the mother of two young children says she had no intention of buying the product for her children — it is for adults ("I'll eat my candy smokes and love it. Get over it. I ain't shoving them down your kid's throats."). A late post asks plaintively: "Do we really need to ban everything?" Educate the public on the health effects of smoking. These programs work. Television advertising about the health effects of smoking is effective. Ban candy cigarettes. This may be too harsh — conceivably some grown people really do need something to hold in their hand or put in their mouth while they are trying to quit smoking. The United States tried prohibiting alcohol and the experiment was not a big success. But some countries (Finland, Norway, the Republic of Ireland, Saudi Arabia and Turkey) have reportedly banned candy cigarettes. 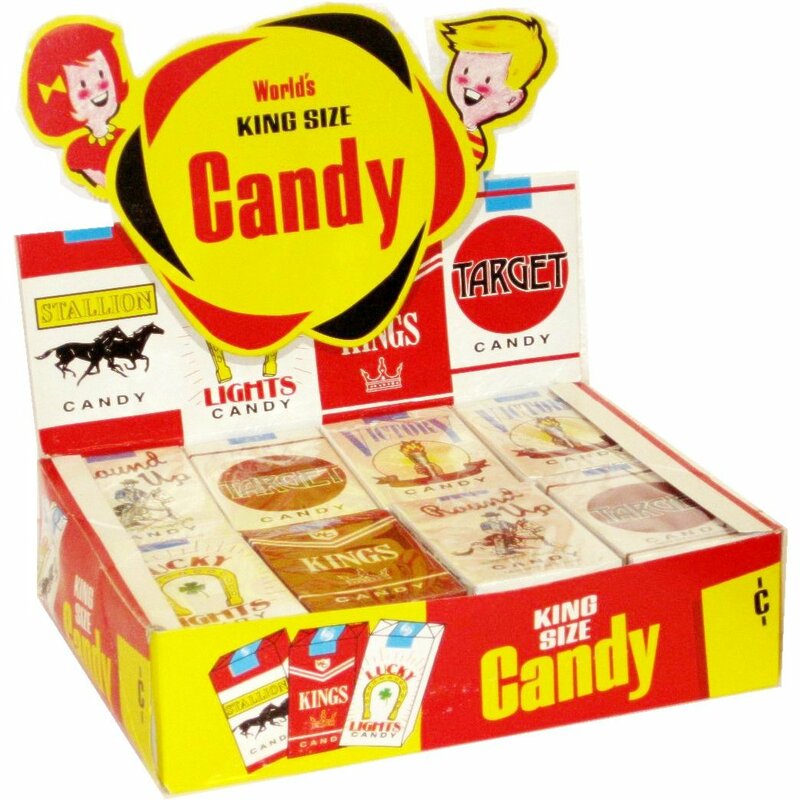 Tax candy cigarettes. A ban equates to an infinite tax. A tax (a "Pigou tax"), is preferable because it uses the marketplace to make the price of candy cigarettes reflect its social costs. Tax them the same as cigarettes. Teenage smoking has fallen because cigarettes are so expensive, so why not try the same approach to candy cigarettes? Make them expensive. Do our kids a favor, and help close the budget deficit!